LOGAN SQUARE — When the Double Door music venue was evicted from its longtime Wicker Park location earlier this week, the club's owners pledged to reopen in a former bank building in Logan Square — but the alderman whose ward includes the site says it won't be easy. Ald. Scott Waguespack (32nd) said most immediate neighbors — both residents and businesses — don't support the move to the stately former bank building at 2551 N. Milwaukee Ave. They believe the rock club would disturb the stretch of restaurants, retailers and apartment buildings near the Logan Square farmers market. "They've got a lot of hoops to jump through," Waguespack said Thursday of the Double Door owners. "The immediate neighbors — the ones that are in the vicinity — by law they get to decide and take a legal position on whether they want it or not. That's what the owners of the property and the Double Door failed to realize. They didn't even know they had to go through a process," the alderman told DNAinfo. Waguespack is referring to the process of obtaining a zoning variance, which is what Double Door would need in order to operate the club out of the Logan Square building. The reason Double Door has to apply for a variance is because the club is applying for a public place of amusement license for a site that's near a lower density residential district. The Zoning Board of Appeals — not the alderman — decides on applications for public place of amusement licenses. The board could grant approval for the zoning variance whether the alderman and neighbors oppose it or not. However, Waguespack said the majority of neighbors within 250 feet of the building oppose the plans, and if those folks show up to the hearing and speak out against the plans, it could heavily influence the board's decision. Double Door co-owner Sean Mulroney and his partner Joe Shanahan have told DNAinfo that they plan to ask permission from the zoning board anyway. Mulroney didn't respond to a request for further comment Thursday afternoon. "The fact that they would move forward without looking at other opportunities probably concerns a lot of neighbors," Waguespack said. At this point the alderman is urging Double Door owners to continue meeting with neighbors who will be most affected by the club. Waguespack said he won't support the move to the Logan Square bank building until the majority of neighbors are sold. If the Double Door owners were to reach an agreement with neighbors, Waguespack said he would welcome the rock club to his ward. "You want to see a music venue like that continue. We're on the same page with that. It's really just a matter of what type of quality of life issues and concerns are at that other location," he said. Waguespack also warned that the move won't happen quickly. Mulroney earlier this week said, "We'll be filing shortly and pulling permits and doing [interior] demolition." The landmark building requires an extensive interior renovation that could take at least a year. That, plus, the "legal hoops," as Waguespack calls them, makes for a lengthy process. "They thought they would be in by the beginning of the year. ZBA takes time, these issues take time. There's no automatic lever for this," Waguespack said. 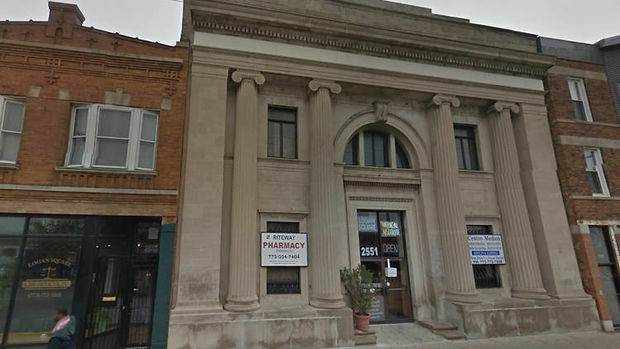 The building in Logan Square, which has a second entrance at 3061 W. Logan Blvd., was built in 1922 and had been the home of the Logan Square Medical Institute and pharmacy since 1970, according to Dina Ruiz, wife of Dr. Gonzalo Ruiz, who sold the building for $2.5 million last March. The building's co-owner, Adam Saffro with New Era Chicago, said that when he and business partner Michael Hagenson bought the building from Ruiz, they were open to several ideas for tenants. The building in the Logan Square Landmark District has two floors, each 6,300 square feet, plus a basement with a bank vault, Saffro said. "The plan is still in the works. They are still pursuing it and I'm hopeful that everything will work out," Saffro said on Thursday.